The highpoint of a visit to Dublin Castle is a tour of the State Apartments. These palatial rooms were where the king or queen stayed when in Ireland. They were also where the viceroy, the monarch's representative in Ireland, lived and worked. Today, they are used by the Irish government for official functions including presidential inaugurations. Accordingly, they have been carefully restored and/or maintained in a tasteful attractive style. You can visit the State Apartments on a guided tour or use the self-guiding option. There is usually a charge for the tour but on the day I was there (a Wednesday), the tours were free. The tickets are for tours that leave at specific times. Therefore, it is best to get your tickets as soon as you arrive at the Castle. This is a popular venue and it may be awhile before there is space available on one of the tours. If there is a wait, you can spend the time looking around the exterior of the Castle until the appointed time. The guide first takes you up a sweeping staircase to the second floor. Perhaps not coincidentally, this is somewhat reminiscent of the route visitors take to the state apartments at Buckingham Palace. Flanking the stairs on either side are large portraits of the 18th century King George III and his consort Queen Charlotte. At the top of the stairs, is Battleaxe Landing, named after the weapons carried by the ceremonial guards stationed here during the viceregal period. The dominant feature of the room are two 18th century Flemish tapestries by Layniers. After passing through the Drawing Room Foyer, you come to a series of interconnected rooms that were once the bedrooms. They all have different uses now although British Prime Minister Margret Thatcher did spend the night in one of them during a European Council meeting in 1979. The first in this series of rooms is dedicated to the leaders of the 1916 Easter Rising. A wounded James Connolly was brought here after surrendering and tried by court marital while still in bed. He was condemned and executed. Portraits and plaques hang on the walls in memory of him and the other rebel leaders. Several of the other former bedrooms are now used as exhibition space. Running along side the bedrooms is the State Corridor. This elaborate arched corridor made for an impressive entrance to the private apartments of the Viceroy. Next, you come to the Granard Room named after the 9th Earl of Granard who made a large gift to the Irish state in memory of his parents who met at a ball in the Castle. Like the other bedrooms, it is decorated in the restrained Georgian style, echoing back to what is often considered Dublin's golden age of architecture and design. The King's Bedroom has become a dining room. It is dominated by a highly polished dining table. Large windows let in lots of light, which combined with the yellow and white color scheme, make for a bright, warm atmosphere. The Queen's Bedroom has been restored to look as during Queen Victoria's official visits to Dublin in the 19th century. Interestingly, it does not have the heavy decoration of the Victorian period but rather is in harmony with the Georgian look of the other bedrooms. Visitors next go along the State Corridor. Although this is essentially a hallway, it is made visually interesting by its archways with inlaid gilded moldings and Waterford Crystal chandeliers, which also enhance several of the other rooms. After passing through the Drawing Room Foyer again, you come to the State Drawing, a large rectangular reception room. This room was largely destroyed by a fire in 1941 but has been restored to its look in the 1830s. The style is much more Victorian and ornate than the previous rooms but still attractive. It contains a portrait that was one of the last works by Sir Anthony Van Dyke. The next room is more elaborate still but in a more baroque-influenced way. 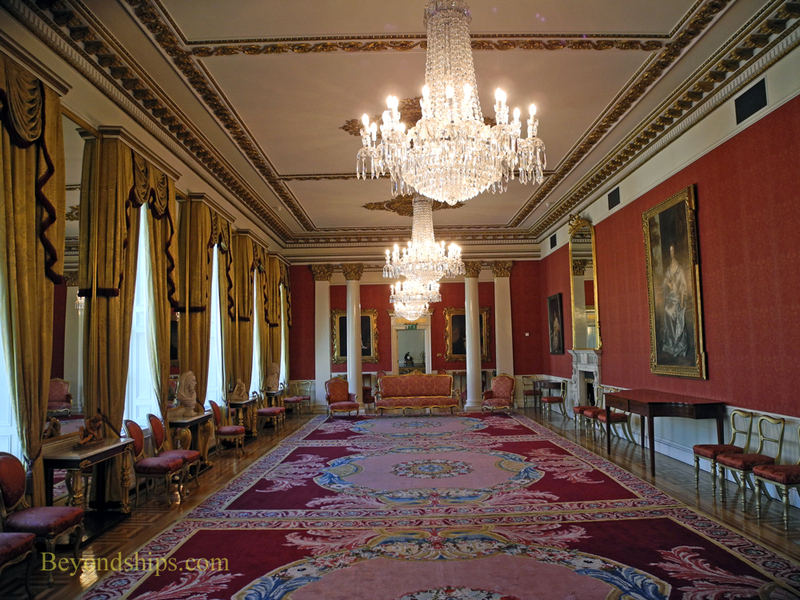 This is the Throne Room, where the King or Queen would hold formal audiences when he or she was in Ireland. Since the monarch only made occasional visits to Ireland, it was more often used by the viceroy for official ceremonies. Dominating the room is the throne, which sits under a gold color canopy. It was made for the visit of George IV in 1821 and as he was a very large man, the throne had to be very large. Adjoining the Throne Room is the Portrait Gallery so named because it contains the portraits of 13 nineteenth century viceroys. Another long rectangular room, this was once a suite of three rooms. It was converted in 1767 into the State Dining Room. During banquets, the convex mirrors on the walls allowed the viceroy to see what everyone else was doing without rising from the table. The chandeliers in this room are not Waterford but rather Venetian glass. You exit through the Wedgwood Room. This elegant, oval shaped room that was once the billiards room. Next, you enter another small room, the Gothic Room. This was once part of the Bermington Tower, one of the Castle's four medieval towers. After a fire in the 1770s, it was rebuilt in the Gothic style. The room was used as a more intimate dining room by the Viceroy and his family. The final room is St. Patrick's Hall, the most spectacular of the State Apartments. Originally, the State Ballroom, it is now used for official ceremonies such as the inauguration of the President of Ireland. Its name comes from the fact that the chivalric order of St. Patrick was formed here in 1783. Although this order was allowed to lapse following Irish independence, the banners of the knights still ornament the walls. Up above are giant allegorical paintings by Vincent Waldre from 1792. Exiting the State Apartments, the tour concludes with a visit to the Medieval Undercroft - - some of the excavations beneath the Castle. Here, you see remains of the Viking-era defense bank, some of the medieval structures and of the moat that once surrounded the Castle.